The German War Machine site was originally built many years ago to support a partwork series published by Windmill Books. Despite being neglected for some time, the site still attracted a reasonable level of traffic. 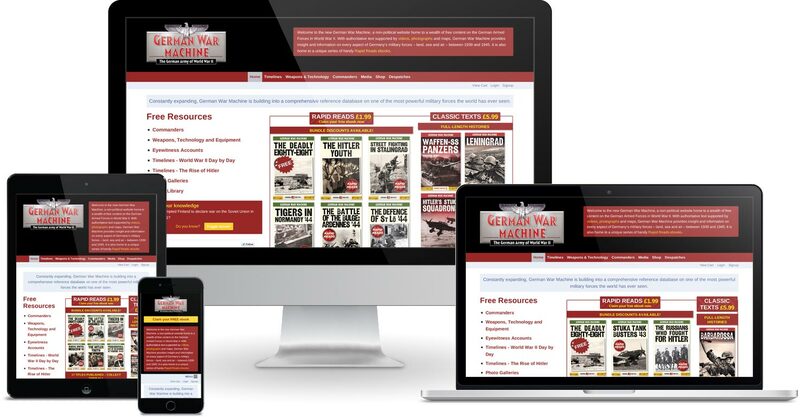 We were asked to update the design and build in an e-commerce element to sell ebooks that would expand on the already comprehensive free information that the site provided. We faced a number of challenges with the site, not the least of which being that the site we inherited did not use a content management system, despite consisting of over 300 pages. So we had to process the HTML files for the site in a semi-automated way to extract the content in a usable form. Given the requirements of the new site, we recommended using ExpressionEngine as the CMS. ExpressionEngine supports a powerful and flexible data model that allowed us to build the different sections of the site using the carefully chosen field types to suit the different types of content. We chose BrilliantRetail as the e-commerce add-on for the site as it supports downloadable products and product bundles. Ebooks are sold as a zip file containing both epub and mobi formats to support the majority of popular e-readers and tablets. Customers are able to leave reviews for the ebooks on the site and there are also affiliate links through to the US and UK Amazon sites should visitors prefer to buy the ebooks from there instead. Windmill wanted customers to get an automatic discount if they purchase a certain number of Rapid Reads titles in one go, so we developed a custom extension for BrilliantRetail to automatically apply a selected discount if specified quantities of products were in a customer’s shopping cart.